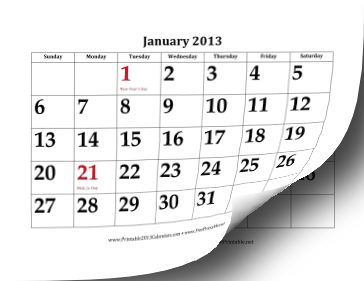 This free printable 2013 calendar displays the dates in large, bold type for people with vision problems or who just like to view the month from across a room. With one month on each page, the calendar downloads in one convenient, 12-page file, in either PDF or customizable DOC format. Major holidays are included in red type and the dates for the holidays are in bold red. Free to download and print.